An example card information screen from the game. 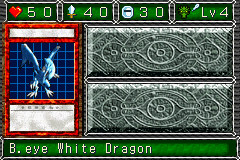 This is "B.eye White Dragon", card number 001. This is a list of cards in Yu-Gi-Oh! Dungeon Dice Monsters. There are 124 cards accessible in the game, although the source code contains data for 202 cards. The additional 78 cards are not visible in normal gameplay. English, French, German, Italian, Spanish and Japanese galleries can also be viewed. No numbering system is visible in the game. The "#" column below enumerates cards in the order they are listed in the game, starting at 001. The "I#" (index number) column lists the numbers used in the code. This page was last edited on 5 September 2016, at 05:19.